You'll be £7.79 closer to your next £10.00 credit when you purchase Bath at War 1939–45. What's this? Bath at War 1939-45 is a comprehensive account of the city’s experience of the conflict, covering in detail life on the Home Front set against the background of the wider theatres of war. The narrative of that global struggle is given with a focus on the ordeals endured by the people of Bath, as they cheered their men and women fighters off to war, welcomed thousands of evacuated men, women and children to the city, and faced the full might of Hitler’s Luftwaffe. Rare insights into the life of the war-torn city are included, along with untold stories from the footnotes of history, from the Bath blitz to the influx of American GIs. The book incorporates memoirs and memories, along with in depth research from official records and newspaper accounts, so the reader sees the war from the perspective of ordinary people, although the military experiences of Bath’s citizens - and in many cases their tragic sacrifices - are also included. More controversial topics are also touched upon, such as civil defence, military injustice, racism and local politics, to give a full and fascinating picture of a great city facing profound trials of endurance and courage, thus revealing the many characteristics which has sustained Bath throughout its illustrious history. This book is a fairly comprehensive chronological narrative of how the city and its people experienced the conflict, covering details of life on the Home Front set against the background global theatre of war. There are insights in to the city's life from memories and memoirs of individual citizens along with much from official records and local newspaper accounts. Nigel and David Lassman are brothers who were born and educated in Bath. Both are authors. While Nigel has written about local & family history, railways and the air war in Malaya, as well as having a keen interest in railway modelling, David has written extensively about music, Jane Austen and the place he now lives, Frome. These include articles for numerous publications, including BBC History, and the books ‘Frome in the Great War’ and ‘The Awful Killing of Sarah Watts’, the latter recounting the town’s most infamous murder. David is also co-creator of the Regency Detective series of novels, set in Bath during the early nineteenth century. 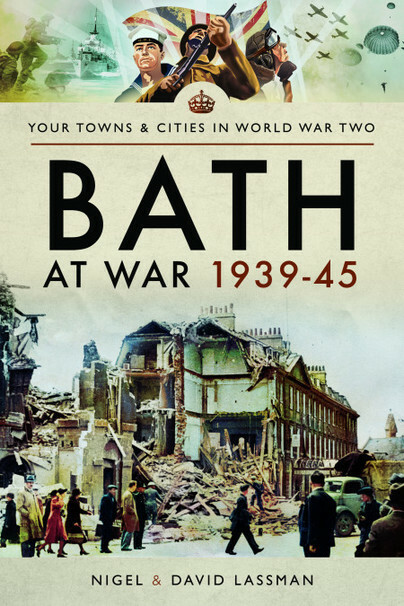 ‘Bath at War 1939-45’ is their first book together.